Marriage Authorisations: Orthodox Jewish marriages need consent of the marriage authorities. 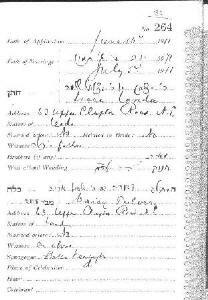 1873 Record of a Jewish Marriage which took place in Leeds, Yorks. 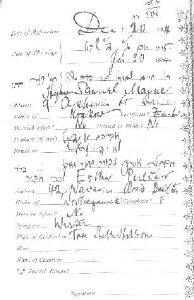 The record comes from a Register of Marriages held at London Beth Din. My Grandparents' Marriage Authorisation from London 1911. What is the difference between a Jewish Marriage Application and a Civil Marriage Certificate? Simply, a marriage application is a statement of intent to marry and a request for permission to be granted by the Chief Rabbi. A civil marriage certificate is proof that two parties were married by an authorised minister. Below are the marriage application and the civil certificate for the marriage of a couple. You can see the differences for yourself. The civil certificate gives the ages of the bride and groom. It gives the occupations of the parties and that of their fathers. It gives the names of witnesses and the minister. The authorisation gives the country of origin of the bride and groom. It gives the full Hebrew names of the parties, including the names of their fathers. It gives the names of the groom's brothers, if any, and which of them will be attending the wedding. Download a PDF file prepared by the Chief Rabbi, Jonathan Rosen. Our Marriage Databases contain a wealth of information so take a look at them! We have an Authorisations Database. All our databases require you to register and login. It's free to do so! Births are recorded civilly after July 1837. See our civil registration page. Newspapers are also a great source of birth announcements. See the newspapers page. Also check out our Birth Databases. Check the civil registration page, registration is required for a burial to take place. Don't forget about our Burial Databases.